When Rebecca and Jared Raskind found out they were expecting, they knew they wanted to design a true nursery. "It was really important for us to have a new, fresh space for the baby. We wanted a space that could also serve as a small play area," says the couple. 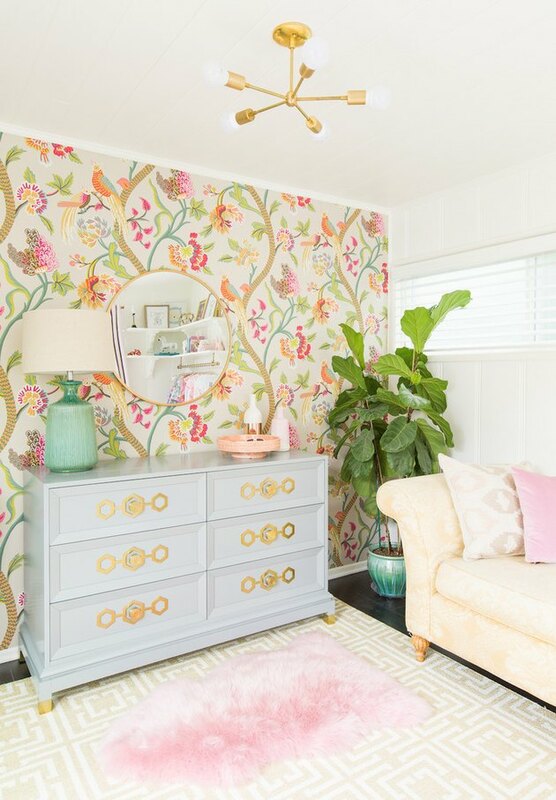 As they knew fairly early on they were having a girl—"We named her Zoe"—the duo wanted to stick to the wildly-patterned theme their home already exemplified, but add a modern, floral twist. So, they tapped online interior design service Laurel & Wolf to help them redesign the space. 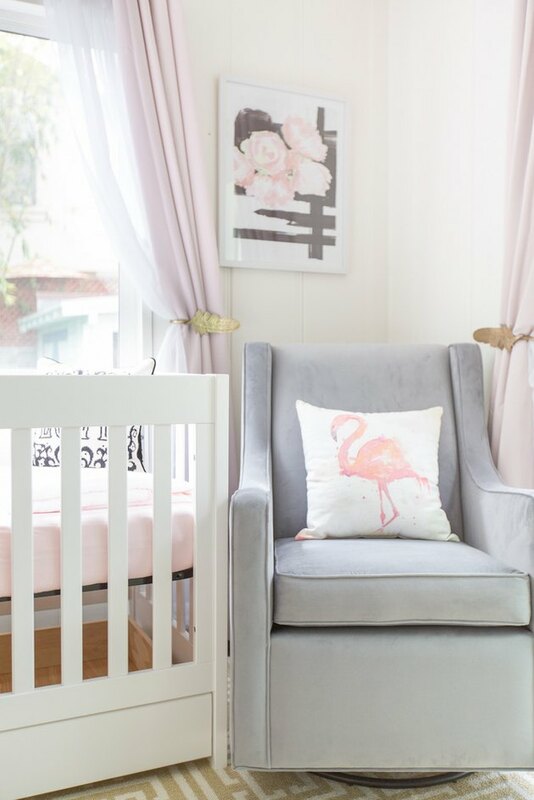 Designer Christina Di Vito says of the home, "Rebecca wanted a glamorous nursery that was still serene, and not overdone. We were definitely going for a high style design that was a bit playful. If I had to choose one word to describe the style of the room, it would have to be glamorous—glamorous with a bit of whimsy." And that style is evident in the statement piece of the room: the eclectic, floral wallpaper (Janta Bazaar in Flax by Thibaut). But of course, if you want to have such a bold, statement-making piece, it's important to balance it out with other, slightly more muted colors. "We stuck to neutral furnishings in gray, gold, and white, and drew from the wallpaper for pops of color in the room. Sticking to two to three colors—in this case, pink, aqua, and mint—kept the space more cohesive," Di Vito says. 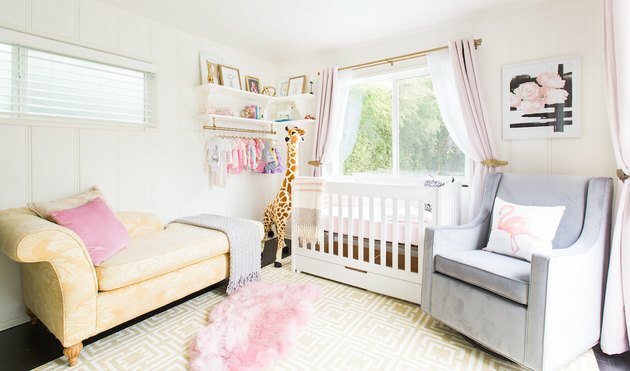 Some more playful touches that fill the nursery with bright personality include a modern chandelier with metal accents ( Willa Arlo, $157.99 ), pastel pink curtains ( Loom Decor, $248 ), a large wall mirror with a gold rim ( CB2, $149 ), and the star of the show—a giraffe named Chloe. Says the couple, "We liked the idea of keeping traditional elements, but incorporating animals, pops of pink, and a lot of pattern. We wanted the space to feel bright and fun." Rebecca adds, "I have a tendency to go overboard with pink, so we started with base colors of grey, gold, and white, and kept pink for the accessories." The biggest challenge of the nursery, however? 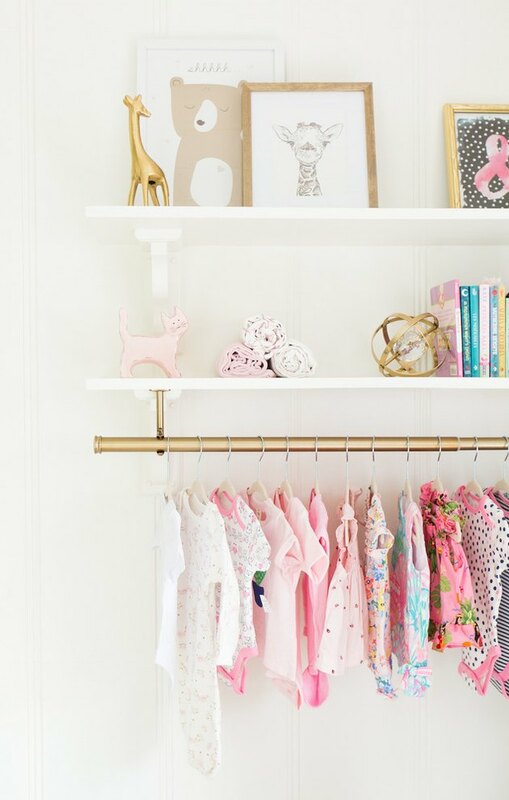 A lack of storage space—where would baby Zoe keep all her clothes? In this case, her outfits added to the whole theme of the room. "We wanted storage solutions, and our designer came up with this great idea to incorporate shelves with a rod underneath to be used for hanging clothes. We actually love that the clothes became part of the decor," says Rebecca. The open shelving has a sort of boutique vibe to it, and it adds to the chicness of the space. 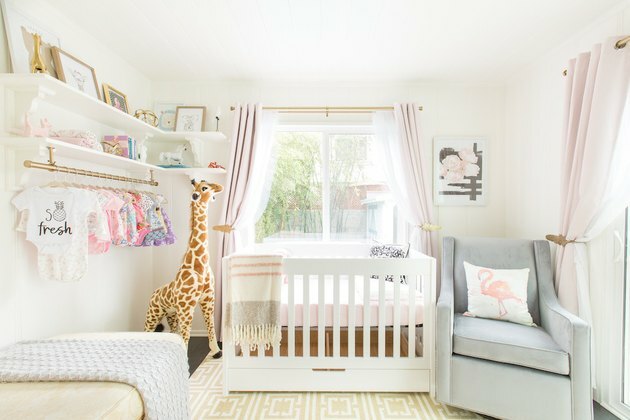 The couple also made sure that, although little Zoe would have her space in the home with the grey convertible crib ( Babyletto, $299 ), the couple would also have their own space to share with their baby girl. The Jonathan Adler dresser, painted a tonal grey ( $2,500 ) doubles as a changing table, while the furry peach carpet ( Viv + Rae, $128.99 ) and soft yellow chaise work to give the nursery a cozy feel. "We will have play time in here on the carpet, read books, rock her to sleep, and use the dresser as a changing table," say the Raskinds.